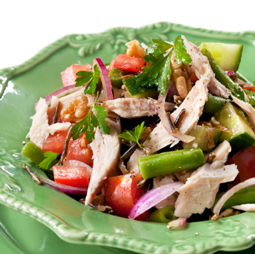 Wild Rice & Tuna Salad - A recipe from Savor California, the online showcase for extraordinary gourmet foods and beverages from California. Cook wild rice according to package directions. When still warm, toss with a small amount of vinaigrette. Cool. Cook green beans until just barely tender. Cut into 1-inch lengths. Chop tomatoes into chunks, and thinly slice cucumber. Thinly slice onion and cut slices into quarters. Place the rice in salad bowls and top with flaked tuna and remaining ingredients.